Steins;Gate is based on 5pb. and Nitroplus' visual novel of the same title. When it comes to entertainment, one of the easiest things to get wrong is the concept of time travel. Part of the reason for this is because our scientific understanding of "reality" is still in its infancy, and this means that the writers for shows like Doctor Who, Quantum Leap, even Star Trek, must apply their imagination and creativity in order to resolve some of the inherent paradoxes that will occur whenever a narrative decides to hop, skip or jump. In other words, they make it up. More often than not the implausibility of any sort of time travel is camouflaged with pseudo-science, techno-babble, and a good smattering of conversational quantum-hokum. These add a veneer of believability so that the average person can achieve the suspension of disbelief required to buy into the storyline. When it comes to anime though, the concept of travelling through time has generally lacked in substance, delivery, and even narrative relevance. 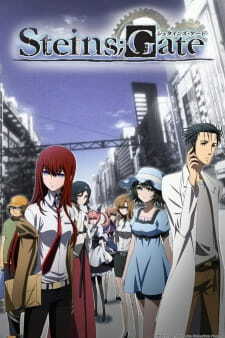 Originally a visual novel by 5pb and Nitroplus, Steins;Gate tells the story of Okabe Rintaro (the self styled mad scientist known as Hououin Kyouma), and his "colleagues" at the Future Gadget Laboratory, Hashida "Daru" Itaru and Shiina Mayuri. Okabe spends his days making strange inventions with Daru, and the oddest one so far is the Phone Microwave [name subject to change]. At first it seems as though this device does nothing more than turn bananas into a green, jelly-like substance, but it has a hidden side effect that no one knows about. Everything seems placid and normal until the day that Okabe and Mayuri decide to attend a lecture given by the eminent Professor Nakabachi on the subject of time machines and time travel. For the most part Steins;Gate is a surprisingly well thought out series that applies the notion of cause and effect in a reasonably intelligent manner. The plot follows a logical, if somewhat timeworn progression, and while there are numerous recycles, repeats, reboots, and "do overs" that form an integral part of any time travel tale, these are handled in a way that would have turned Endless Eight from tedium incarnate into an arc that was at least watchable. The show throws around a number of concepts and theories to explain or justify certain aspects of the science fiction, and on quite a few occasions these have been woven into the main body of the plot very well. Ideas like the Butterfly Effect (which, given the visual cues, should be obvious to anyone), the Observer Effect and Schrödinger's Cat have been used to support the problems caused by time travel (and their resolution), and in that respect Steins;Gate deserves a good deal of praise for trying to use science to support the science fiction (and it does it far better than the likes of Puella Magi Madoka Magica). Unfortunately it's not all fun and games. One of the problems within the narrative is the inevitable conflict between human drama and science fiction, and in true anime fashion the emotional side wins out. This has the unfortunate effect of removing much of the chaos that is inherent in a story about time travel, and replacing it with predictability and melodrama. Thankfully the human side of the tale is handled in a surprisingly decent manner, but this is tempered by the fact that a number of basic questions are never actually addressed. The very nature of this anime automatically requires that certain aspects be resolved or explained, and while there are all sorts of "scientific" reasons flying around, the series tends to shy away from tackling certain first order issues like the Grandfather Paradox. There's also the matter of the rather "neat" ending, but we'll get to that in a bit. Steins;Gate is a very good looking series, but as with any adaptation from another visual medium, there's an automatic limitation placed on aspects like character design. That said, White Fox have produced a series that viewers may find appealing, if a little generic at times, and have used what they've been given to very good effect. The character animation is of a high standard, and many of the visual effects are imaginative and well choreographed (which should be no surprise given that White Fox also produced Tears to Tiara and Katanagatari). It's unfortunate then, that the typical anime mentality comes to the fore in the little details, the main one being the distinct lack of variety where clothing is concerned. Everyone seems to have only one outfit, which may seem a little picky to some, but imagine how you would feel if you wore the same underwear for three weeks while running around and in mostly warm weather. This mentality also comes to the fore in the script, and while the majority of the dialogue in the show is actually pretty good, the usual shenanigans come out to play at times when there really doesn't need to be any more drama. Thankfully the voice actors are experienced enough to know how to deal with the scriptwriters' attempts at overcompensating for various shortcomings, and in truth they're the ones that carry this series. If it wasn't for the talents of Miyano Mamoru, Imai Asami, Seki Tomokazu, Hanazawa Kana, and the rest of the cast, Steins;Gate would quickly collapse under its own weight, and it's thanks to the seiyuu's abilities that the more technical or scientific portions of the script can be delivered in a manner that fits with the narrative. The opening sequence features Hacking The Gate by Ito Kanako, a fairly average J-pop track track that has been set to a montage of most of the characters who seem to be deep in contemplation while a variety of clock faces, cogs and technical looking diagrams zip around the screen. On the other hand, The Twelve Time Governing Covenants by Sakakibara Yui works rather well as the closing theme, and for the most part the end sequence is a far more subtle and off kilter affair that is more in tune with the atmosphere of the series proper (until the last few seconds that is, and one has to wonder about the mentality of the person who thought ending the sequence like that was a good idea). As for the background music, there's a rather nice variety of tracks that are often very subtly used. More often than not the series relies on mundane noises and silence, and because of that attention has been paid to the timing and usage of the score. Steins;Gate has a core set of characters who are surprisingly well defined from the start of the series, but in terms of overall development much of the growth applies only to Okabe. Now this isn't really surprising given the events in the story, and to be honest the show is actually better with his character being the only one who truly changes. Okabe's development when dealing with the events that are rapidly spiralling out of control is handled in a sensitive yet realistic manner, and it's nice to see that the anime hasn't shied away from depicting the apathy he feels after experiencing a series of personally harrowing events. Unfortunately the attempts to further develop some of the other characters tend to fall a little short of the mark, and this leads to a few situations that effectively remove the dramatic tension that has been painstakingly built up. The sad part is that while it's laudable to try and develop characters like Suzu, Mayuri, Feyris, and even Tennouji Yugo (Mr Braun), this should never come at the detriment of the main storyline. Steins;Gate is a very entertaining series that isn't afraid to play around with various scientific concepts, but at the same time it clearly avoids tackling certain major issues related to time travel, and the focus on human drama can sometimes be at odds with the events in the storyline. That said, it's a very enjoyable anime that doesn't get too bogged down in technicalities, and while I rather liked the fact that Okabe cast himself in the role of mad scientist (complete with laugh), imagine my surprise at finding out he's supposed to be 18 years old. Which brings us back to the ending. There's a certain ... "clinical" ... feel to the conclusion that really doesn't sit too well, and while it's always nice to see a story end happily, one has to wonder about the plausibility of it all. The thing is, Steins;Gate uses a concept of time travel similar to that used in Quantum Leap, and therein lies the problem. Anyone who is familiar with the latter series knows that Dr Sam Beckett (an actual doctor, not an 18 year old first year student like Okabe), is unable to return to his original timeline because too many changes have been made to past events. In the nomenclature of Steins;Gate, he's moved across too many world lines and affected too many lives, and this is one of the major things that Steins;Gate glosses over completely. Now one could argue that the idea used in the series creates an effective escape clause, but that only covers certain people. The simple fact is that everyone you meet when you travel through time, no matter how brief the contact, is affected by your presence, so in order to return to one's original timeline, one must undo every contact with every person, even down to brushing shoulders with a total stranger on the street. One of the other aspects that really should have been explored is Okabe's ability, Reading Steiner. At no point does the series delve into why he has this ability or how it works, and this is more than a little odd given how much importance is placed on "Fool yourself. Fool the world". Even with those issues though, Steins;Gate is easily one of the better science fiction anime to appear in the last few years, and while there are areas that could have been improved upon, the whole is greater than the sum of its parts. Steins;Gate is an enjoyable romp in the realms of implausibility that delivers on several levels, and while the happy ending may not sit well with everyone, the conclusion to the story does offer a degree of catharsis. It's just a shame that everyone seems to think you need a happy ending in order to make a story great. Such a powerful quote, from an anime at least just as powerful. It’s one of the many wise quotes featured in the excellent time travelling tale called Steins;Gate. It is a story praised by many, and I think the show is definitely worthy of all its praise: it’s an excellent piece of work. Steins;Gate is, in essence, a unique anime. There’s not a single show that I found to be comparable to Steins;Gate. But why does everyone think of Steins;Gate as such a masterpiece? Steins;Gate is about Okabe Rintarou, a “mad scientist” who spends his time hanging out in his laboratory with his friends Mayuri and Daru. Ocassionally, they manage to invent futuristic gadgets, though these are never worth mentioning. The first few episodes may turn you down, as it seems like your general slice of life/comedy anime. However, when their most interesting invention, the Phone Microwave, turns out to be able to send text messages through time, everything changes: the text messages sent to the past have a huge impact on the present. When Okabe, in a horrifying way, finds out about an evil organization called SERN, and their ways, he is forced to use time travelling methods to prevent from getting captured – and stop their plans. This (around episode 9) is where the amazing Sci-Fi thriller fires up its engines, and puts the viewer on the edge of their seat. What follows is a fascinating (somewhat complex) plot, which manages to blow your mind each episode. Steins;Gate is not just your generic time traveling show; the plot is executed perfectly. Hardly ever before have I encountered such a well thought through plot as featured in Steins;Gate. The show features several jumps in time, but still manages to keep the viewers’ attention without confusing them. The pace present in Steins;Gate is not lacking either – in fact, from episode 9 onwards the show holds a perfect pace. Piece by piece, the mystery of the events that happen is unveiled, working towards a fantastic, satisfying ending. (Which is very rare, especially for a show with such a complex plot) Story - and plot wise, Steins;Gate is pretty much an unprecedented piece of art, and I think it might stay so for a while. This is the field in which Steins;Gate lacks the most. Steins;Gate isn’t a show with a huge budget, and therefore it is to be expected that the art isn’t jaw-dropping. However, this doesn’t mean that the art is bad, or that the drawing style is unbearable. In fact, the goal of the art is to portray the atmosphere as well as possible – and it does: the art style simply has a way more realistic feel to it than your generic anime. Amazing voice acting, nice opening, and decent BGM. There were quite some moments where I think there could have been made better use of background music, which is why it misses out on a perfect score here. Nonetheless, very solid sound overall. What can I say, the characterization in this one is just fantastic. The characters are written in such a way that you are bound to like them. They all have their own likeable and recognizable traits, which are perfectly described from the start: Makise Kurisu the tsundere, Daru the nerd, Mayuri the childish girl, and so on. I found myself having a weak spot for Kurisu in no time. There’s hardly any character development, but I think this is not necessarily a bad thing; it would only distract from the fantastic plot that is ahead of the viewer. The only character which, logically so, develops, is Okabe: you’ll find him changing in character over the course of episodes, due to the events that unfold. But this is all for the better: this development is, again, done exceptionally well. The development has a very realistic feeling to it (And so do all the characters in general), which makes the story as a whole even more compelling. Steins;Gate is one of the few shows that manages to score a 10 on enjoyment for me. Like most people, I found Steins;Gate hard to get into, as the first few episodes don’t really cover much ground. However, once the engine got running, I was hooked. I couldn’t refrain myself from watching episode after episode, slowly crawling to the awesome ending ahead. And I think most people would; as the plot is set up in such a way to keep you hooked each episode. If you are a fan of Sci-Fi, then you will surely enjoy this anime – but that’s not a necessity. Steins;Gate is an anime that is very likely to keep you hooked. So go ahead, you won't waste your precious time. In fact, you might want to go back in time to watch it again! The subject of time travel is no stranger to the world of anime, so it takes a lot of work to make a time travel story stand out. For Steins;Gate, that hard work paid off. This is by far the best-executed time travel story that I've ever seen in my experience with anime, and if you haven't seen it yet, you're definitely missing out! The story revolves around the antics of Rintarou Okabe, a self-proclaimed mad scientist that goes by the alias "Hououin Kyouma," as he essentially dicks around with time and subsequently deals with the consequences of his selfish actions. I'll be completely honest and say that the incredibly slow and random start to the anime threw me off so much that I re-watched the first episode 4 times over the course of 6 months before I could resolve to just pushing onward and finishing the anime. However, this slow start is balanced out by the fast-paced second half. By the end, it was answering questions that I never thought to ask, pointing out the significance of things that had long been discarded by my mind, and that sense of tying up loose ends is just the most refreshing feeling to have after dealing with so many time travel stories that are too lazy to clean up after themselves. Unlike many time travel stories, especially in the world of anime, Steins;Gate has no noticeable inconsistencies objectively. I say objectively because this is a science fiction story, and that makes it really hard for everyone to agree on it. The thing is, none of us have experienced time travel in the way the characters in these science fiction stories have (and if you have experienced it, I'm very sorry for making assumptions), so there isn't a clear right or wrong way to write a time travel story. Obviously, if a story contradicts itself, something went wrong. But Steins;Gate seems to obey its own rules, and while a lot of people have made very compelling arguments that point out flaws in Steins;Gate's concept of time travel, they all make assumptions about how time travel works, and no one can really say for sure how things would change if we altered the past. In the end, this isn't a science textbook, it's a science fiction anime. It's not supposed to be 100% believable, otherwise we wouldn't be able to watch it and say "wow, that was unbelievable!" I give the story a 10/10 because it was interesting, well-researched (many ideas are borrowed from other works of science fiction and played with), and overall just plain entertaining. I really prefer talking about the art of a particularly spectacular-looking anime or else a particularly underwhelming-looking anime. Since the art in Steins;Gate is neither extremely good or extremely bad, I'll rate it an 8/10 for not influencing my opinion of the anime in either direction. Consider it a passing grade, basically where we should expect the art quality of anime to be in this day and age. Anything better would be remarkable. I can't say much for the soundtrack, but the voice acting is awesome! Okabe's seiyuu is all kinds of talented, but everything good about the sound in this anime, and really, everything good about life in general, can be summed up in the maniacal laugh of Hououin Kyouma. I can't really speak for the English dub, and while I love Michael J. Tatum's work in Baccano, what I've heard of the dub sounds to be sorely lacking compared to the Japanese voices. Miyano Mamoru is just so cool! Sonuvabitch! One thing of note about the soundtrack is the lack of one for a large portion of the anime. During quiet moments, rather than listening to quiet music, you're usually just listening to nothing. This is something that I've seen a few times, and I think it's pretty cool. It accentuates the importance of those scenes that do have music, and at the very least creates a nice contrast of mood, not between happy and sad music, but between silence and... not silence. You should know that while not each and every character is the pinnacle of how great anime characters can be, they're all very interesting, entertaining, and Hououin Kyouma can handle being the pinnacle of just about everything. But really, my rule for judging a character to be good is that I either like them or appreciate how much I don't like them. There are characters that I like and characters that I don't like in Steins;Gate, but all of them fit, and none of them are pointless and annoying. And yeah, Okabe is startlingly charismatic, and that can take an anime pretty far in the character department. This anime made me laugh maniacally and cry silently. It also made me think, and it rewarded my thoughts by having closure and clarity, which left me more than satisfied. Easily a 10/10 anime, and now one of my favorites that I've seen! As you may have noticed, Steins;Gate is revered as a masterpiece by most. For those of you who haven't had the privilege of watching this show yet, i'm writing this (belated) review to emphasize just how much you're missing out on. First of all, you have to understand that Steins;Gate is completely unique compared to other anime, in terms of story line. Now, with such a complex plot, it would be incredibly easy to mess the series up. Except that they didn't. If they did, it wouldn't a masterpiece. Steins;Gate explores the world of time travelling and time lines, putting in acknowledgements to theories such as the butterfly effect and how, once you change a minor thing of the past, the future transitions into one large scrambled egg. Once you pass the first slow starting episodes, the intrigue and mystery begins, and the pace of the series accelerates. The plot throws in numerous surprises and sudden, unexpected turns that, in turn, creates a powerful ending that is almost flawless. Also, you're hit bluntly in the face with quite a lot of feels early on in the series. One of the great things about Steins;Gate is that the characters are developed incredibly well. Astonishingly well. To the point that you feel connected with them in terms of their feelings and aims. They each have their quirky side too - not everything is all serious. I'm talking about the mad scientist personality, the Dr.Pepper jokes and Daru's perverted jokes which lightens up the series so that it isn't all serious drama. But the trouble is, the more like able the characters are, the harder you find it to leave them behind when the series ends, meaning that even a week after Steins;Gate ends, you'll probably still be thinking about Okabe whenever you spot a bottle of Dr.Pepper. I didn't really pay attention much to the soundtrack of the series, i admit, due to the fact that i didn't find it all that enthralling or unique. However, i did enjoy the opening and the ending particularly. Aside from that, the soundtrack did it's job of emphasizing the mood/atmosphere of scenes pretty well. The animation in itself was done really well though - i found that the consistency was great, meaning that (to my eye) there was no sudden drops in quality. Something that i loved the most was that the ending was fantastic. There were barely any loose threads, and as a poor ending can sometimes ruin a good series, i'm grateful that they executed such a content finale. I stress that you must watch this series. It's not enough for you to read however many reviews you can lay your eyes on, but to actually experience this masterpiece for yourself. Time travel is a ubiquitous topic in all kinds of storytelling and anime is not an exception. In this article, we take a look at the different ways that it is implemented and provide some particular examples in anime.